This is a guest post from Anna Spurling. In it, she shares her experience of using exercise to manage her mental health. This is something I am SO passionate about yet, whenever I talk about it, it just doesn’t seem to cut through. So I’m hoping Anna’s words and experience resonate with any of you struggling to prioritise regular exercise in your days. Take it away Anna! I spent a lot of my late teens and early twenties exercising myself into a fit, lithe young lady. I adored the way my body looked (although I reckon at the time I hated it but age and gravity gives you perspective). I was a reasonably serious rower who was required to attend many sessions per week on the water, in the gym, on land, at regattas. In the off season, I would run and play netball and I guess for a while I was blessed with good genetics and strong mental health. At university, after I narrowly missed out on a rowing scholarship with the Australian Institute of Sport, I spent the rest of my degree drinking heavily in bars around Canberra and then Europe. My self-esteem plummeted but I never once made the connection between exercise and a well-balanced mental state. At least a decade went by before I did any real form of exercise again and to be honest, it was so reluctantly undertaken. During this time, I suffered significant panic attacks, depression that was so serious I needed to see a psychiatrist and then unsurprisingly, (although thankfully mild), post-natal depression. My relationship with exercise was always goal oriented. I did it to get fit for the boat, to lose weight, to correct a back injury or to run a particular race. It was never just because it made me feel good. Yet every single time I exercised I felt good. I never regretted a work out. I didn’t always listen to my body but I never regretted a work out. When my anxiety hit me hard I had to work out a way to get out of the darkness. I was in a very lonely place but I listened to those around me who gave me some tremendously helpful advice. Deep down I already knew the truth in what they were saying but I had ignored it for so long. Exercise is good for my head. This approach completely shifted my attitude towards exercise. I began to see exercise as an enjoyable experience instead of a chore and the benefits were immense. So how can I convince you to add exercise to your day to make your head feel fabulous? I’m not going to tell you that I am busier than you because busyness is relative. Plus I am trying to unbusy myself. But I will tell you if you schedule your exercise in then you will be more likely to stick to your plan. The Baker and I have negotiated our diaries to schedule our own time for exercise. We’d love to do more exercise together but the realities of life make that tricky. I get Monday nights, he gets Tuesday mornings and so on. When it is in the family diary and there is no other time that you can fit it in then you will stick to your slot. If your only motivation is because you need the break from the routine of putting the kids to bed AGAIN then roll with that. After a while, you’ll realise that your head needs the endorphins. If you hate running, don’t sign up to a half marathon. I don’t mind running but the training is hard work and sometimes it frazzles my adrenally challenged system. On the other hand, I never find Pilates hard work. I can still get to a class when I am tired, injured or just not feeling that great. I love walking as well and personally think that it is one of these most amazing ways to get those endorphins going. From my personal experience of walking 30 minutes every day to literally walk away from anxiety, I can’t recommend it enough. Nowadays, I try and walk the kids to and from school or throw in an incidental walk where I can. Hitting 10,000 steps is addictive after a while! Exercising alone can be freaking hard work. Knowing that you need to meet a friend on the corner at 6.30am is excellent motivation for getting out of bed. I love my Saturday morning long runs because I get to chat to people the whole time. I love Pilates because I catch up on people’s lives whilst stretching myself to happiness. You don’t have to meet up with people all the time as exercising alone gives you the chance to zone out as well. Sometimes a solo run or walk is incredible for clearing the mind. Work out what works for you and stick to it. If you commit to a few weeks of walking, say 20 minutes a day, and then put your hand on your heart and say that you don’t feel any better then I will eat my hat. The anecdotal evidence is overwhelming and whilst I can bombard you with scientific reports to support my arguments, the reality is that you have to want to do it for yourself. So all I ask is that you take the pressure off yourself and decide that you are going to exercise to see if you feel better. That is your only goal. 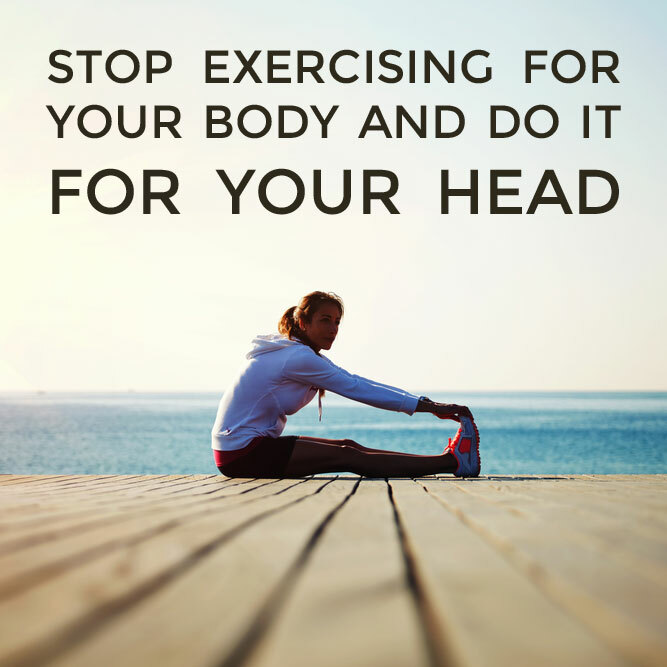 Not weight, not muscles, not a finish line but a successful way to manage your head. That right there is amazing motivation and I promise it is not as hard as it sounds. I’m not a fitness junkie by any stretch of the imagination. I just took a long time to make the connection that exercise in its beautiful, gentle form is incredible for managing anxiety. Keep it realistic, interesting and simple and it will give back spades to your mental wellbeing. That is worth the lycra in my book. NOTE FROM KELLY: If you’re now feeling fired up to get back on the ‘regular exercise’ train, you might be interested in the Better Than Yesterday ‘Move’ Challenge which starts on Monday 10 April and goes for 21 days. Find out more here. Anna Spurling blogs at Colour me Anna where she shares her experience of managing anxiety and mental illness. When depression set up camp in Anna’s head, it drained the colour from her world. Fighting her way out of the grey, Anna chose to reintroduce colour by connecting emotions with them. Since then, she has coloured herself calm, honest, raw + slightly amusing in a series of blog post that explore an anxious and noisy mind, wellbeing, exercise + parenting. 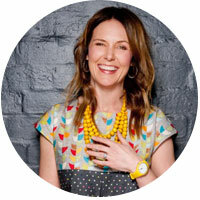 Anna also has a regular column with the Geelong Advertiser’s GT Magazine.